In addition to being a premier location for birds, Arizona is also a great location for butterflies. Throughout the year, my backyard will see Monarchs, Queens, Gulf Fritillarys, Black Swallowtails, Western Pygmy Blues, Marine Blues, Leda Ministreak, Painted lady, Orange Sulphur, and many others. 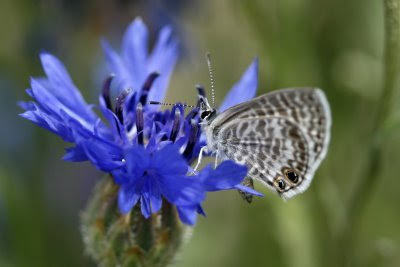 Today I happened to notice a large number of Marine Blue's in a patch of Blue Cornflower. This is a tiny butterfly that without careful observation, looks like a generally plain white-ish butterfly. However, with the help of a macro lens, it turns out to be quite an interesting little lepid. The Marine Blue is close to double the size of a Western Pygmy Blue, which is truly tiny - perhaps 1.5 cm across. 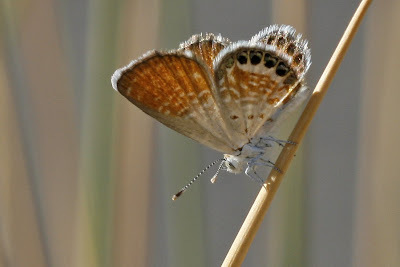 My other recent find was another tiny butterfly in Madera Canyon in southeastern Arizona. 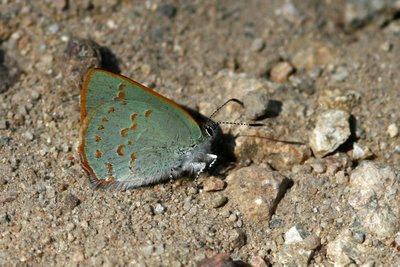 Here, several Arizona Hairstreaks were seen basking in the sun. The exterior of their wings are green and orange, as seen here. However, the interior is a deep blue.